Nasal endoscopy involves evaluation of the nasal and sinus passages with direct vision using a magnified high-quality view. It is a commonly performed procedure in the otolaryngologist’s office and serves as an objective diagnostic tool in the evaluation of nasal mucosa, sinonasal anatomy, and nasal pathology. Nasal endoscopy may be accomplished with either a flexible fiberoptic endoscope or a rigid endoscope (see the images below). When performed by experienced practitioners, both flexible endoscopy and rigid endoscopy are usually well tolerated. Flexible endoscope. Image courtesy of Wikimedia Commons. 4.0 mm and 3.0 mm rigid nasal endoscopes. The fiberoptic telescope has the advantage of being flexible and generally smaller in diameter, which means that it is readily manipulated in multiple directions to permit visualization of tight areas. However, flexible endoscopy requires 2 hands for manipulation of the instrument and is thus a more difficult procedure. Traditionally, flexible endoscopy has provided inferior visualization, but this drawback has been overcome with the development of digital flexible endoscopes. The rigid endoscope provides superior image clarity, facilitates culture and tissue sampling, controls epistaxis better, and affords the endoscopist the ability to perform surgery. [1, 2] Rigid endoscopes for the nose come in diameters of 2.7-4 mm and have tips of different angles (generally 0-70º), allowing the physician to visualize various sinuses and areas within the nasal cavity and sinuses. In addition to affording superior visualization, nasal endoscopy provides improved illumination, greater magnification, and the ability to navigate directly to pathologic areas. As a result, examiners obtain a more accurate and thorough diagnostic evaluation. In one study, rigid nasal endoscopy identified nasal pathology in almost 40% of patients who had normal examinations on anterior rhinoscopy. Endoscopy plays an important role in the preoperative, postoperative, and medical management of patients with sinonasal complaints. Nasal endoscopy has a clear role in the identification of sinonasal disease in patients presenting to the otolaryngologist's office. It should be viewed as an essential component of a complete examination of the nose and sinuses. No absolute contraindications to nasal endoscopy exist; however, some patient populations are at increased risk for complications. In patients who have a history of a bleeding disorder or are receiving anticoagulants, nasal endoscopy should be performed carefully so as not to provoke bleeding. Additionally, in an anxious patient or a patient with cardiovascular disease, there is a risk of a vasovagal episode. The septum is a midline bony and cartilaginous structure that divides the nose into 2 similar halves. Regarding the lateral nasal wall and paranasal sinuses, the superior, middle, and inferior concha form corresponding superior, middle, and inferior meatus on the lateral nasal wall. The superior meatus is the drainage area for the posterior ethmoid cells and the sphenoid sinus. The middle meatus provides drainage of anterior ethmoid and the maxillary and frontal sinuses. The inferior meatus provides drainage of the nasolacrimal duct. The internal nasal valve involves the area bounded by upper lateral cartilage, septum, nasal floor, and anterior head of the inferior turbinate. This makes up the narrowest portion of the nasal airway in the leptorrhine nose. For more information about the relevant anatomy, see Nasal Anatomy. Nasal endoscopy and imaging are the 2 most widely used objective measures in the diagnosis of chronic rhinosinusitis (CRS). Endoscopy has multiple uses in the management of patients with sinonasal symptoms and plays an important role in both the preoperative and postoperative management of patients. The Lund-Kennedy endoscopic scoring system quantifies the pathologic states of the nose and paranasal sinuses, focusing on the presence of polyps, discharge, edema, scarring, or adhesions and crusting. Endoscopic staging is performed bilaterally and typically takes place during the initial evaluation, preoperatively, and postoperatively at regular intervals (intervals of 3, 6, 12, 24, and 36 months are recommended). The addition of nasal endoscopy to the care of patients with CRS has resulted in improved diagnostic accuracy. [4, 7] In combination with established symptom criteria, endoscopic findings improve the specificity, positive predictive value, and negative predictive value of assessment for CRS. This development suggests that the use of diagnostic endoscopy may help decrease the need for computed tomography (CT) and reduce costs and radiation exposure. In a triological society best-practice article discussing the role of nasal endoscopy in diagnosing CRS, the authors concluded that nasal endoscopy alone has low sensitivity but has consistently demonstrated high specificity in identifying CRS, making it a useful confirmatory test. Nasal endoscopy was also found to have high diagnostic accuracy in individuals with the combination of symptom criteria and positive endoscopic findings. It is in these patients that a diagnosis of CRS may be made without additional imaging. In a study that employed nasal endoscopy to obtain cultures for microbiologic diagnosis, 90% of the specimens collected by nasal endoscopy resulted in a culture with 2 or fewer bacterial isolates, and 55% of these contained a single isolate. These results are superior to those obtained by means of a nasopharyngeal swab. Postoperatively, endoscopy plays an important role not only by monitoring for recurrence of pathology but also by allowing timely debridement in the immediate postoperative period. 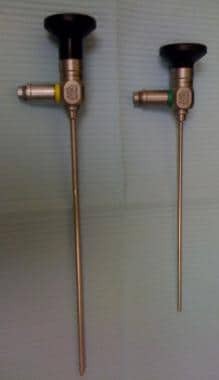 Rigid endoscopes (see the image below) are made in various angles (eg, 0º, 30º, 45º, and 70º). The angled telescopes are used to see around corners and to evaluate areas not easily examined under direct vision. The 4 mm 30º scope has been shown to provide sufficient illumination and an adequate field of vision and may therefore be the most useful telescope in an average patient. Nasal endoscopes also come in pediatric sizes (2.7 mm), which are also available in various angles and which may be used for increased comfort in adults. The use of video systems (see the image below) has become increasingly popular in nasal endoscopy. Although the addition of video capability makes the procedure significantly more costly, it enables the practitioner to make recordings of the examinations, which can subsequently be reviewed with the patient and compared with previous videos to determine response to treatment. Video system for recording and reviewing endoscopic examinations. 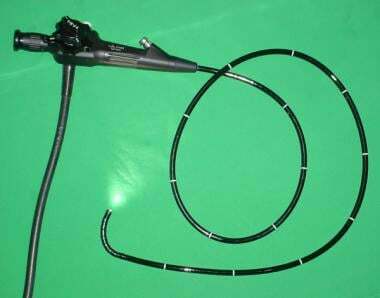 Minimum requirements for basic nasal endoscopy include an endoscope, a high-quality light source and light cable, and a suction device to clear secretions. In addition, sinus instruments (eg, a Freer elevator, a Blakesley forceps, or a through-cutting instrument for obtaining biopsy specimens) can be useful for performing procedures. Patient preparation includes adequate anesthesia and appropriate positioning. Before nasal endoscopy, nasal cavities are often sprayed with a nasal decongestant, such as oxymetazoline. It is sometimes useful to performing endoscopy without decongestion, however, particularly for patients with presumed turbinate hypertrophy, in whom it is worthwhile to perform endoscopy before and after decongestion. In certain patients, especially those who will be undergoing a surgical procedure, local anesthesia is employed as well; lidocaine 4% is a commonly used topical anesthetic. When cultures are indicated, however, anesthetics should be avoided so as to provide the best chances of bacterial growth on the swab medium. Anesthetics are typically applied either with a spray atomizer or directly on a cotton pledget. Before application, patients should be questioned about medication allergies. The topical anesthetic should be applied to the inferolateral surface of the middle turbinate, to the surface of the inferior turbinate, and to any other sites where pressure may be exerted by insertion of the scope. During the endoscopic examination, patients should be seated upright in the examination chair. The patient’s head can be manipulated as needed to afford better viewing of the nasopharynx or the olfactory cleft area. After applying a nasal decongestant and, occasionally, a local anesthetic to the nasal cavities, the endoscope is introduced. Typically, a 3 mm or 4 mm 0º or 30º scope is selected first, and an antifog solution is applied before its introduction into the nasal cavity. The examiner then performs 3 separate passes of the scope in each nasal cavity (see the videos below). [2, 16, 17] With each pass, the appearance of the nasal mucosa and the structures of the nasal cavity are examined. In particular, the examiner notes the color of the nasal mucosa (pale vs hyperemic), the presence of inflamed or hypertrophic mucosa, the presence of nasal polyps or secretions (purulent, thick, or thin), and any visible anatomic abnormalities (eg, a septal deviation or spur, concha bullosa, or accessory ostia). Rigid nasal endoscopy performed in clinic. Mild left septal deviation is seen anteriorly. Left middle turbinate and middle meatus are normal. Video courtesy of Vijay R Ramakrishnan, MD. Rigid nasal endoscopy. Right side contains normal turbinates and middle meatus with small amount of mucus in inferior meatus. Endoscopy concludes with visualization of soft palate, nasopharynx, and eustachian tube orifices. Video courtesy of Vijay R Ramakrishnan, MD. With the patient’s head flexed, the scope is passed along the floor of the nasal cavity and into the nasopharynx. The inferior meatus is examined where the nasolacrimal duct drains, along with the inferior turbinate. As the scope is advanced posteriorly into the nasopharynx, attention is paid to the potential presence of mucus or purulence draining into the nasopharynx. The entire nasopharynx is examined, including the eustachian tube orifices and the fossa of Rosenmüller. For the second pass, the endoscope is passed between the middle and inferior turbinates to examine the inferior portion of the middle meatus and the fontanelles, as well as to look for evidence of accessory maxillary ostia. Next, the scope is passed medially and posteriorly to the middle turbinate to examine the sphenoethmoid recess located medial to the middle and superior turbinates. The slitlike or oval ostia of the sphenoid sinus may be visualized with the superior turbinate during this pass. The scope is then, upon withdrawal, rotated laterally under the middle turbinate to examine the infundibulum, uncinate, and ethmoid bulla. Gentle medial pressure may have to be applied to the middle turbinate to allow the scope to be inserted into the middle meatus. The third pass often requires a 30º endoscope or repositioning of the head. It should allow the practitioner to evaluate the olfactory cleft to look for any lesions or polyps in this region. Often, the curvature of the septum is such that the evaluation can be done adequately on only 1 side of the nose. Overall, rigid nasal endoscopy is a safe and low-risk procedure. Potential complications associated with the procedure include an adverse reaction to the topical decongestant or anesthetic, pain or discomfort, epistaxis, and vasovagal episodes. Before the topical medications are administered, the patient’s allergies should be verified. In patients at increased risk for bleeding (eg, those with a family history or personal history of bleeding disorders and those currently receiving anticoagulants), care must be taken; nasal hemorrhage secondary to mucosal trauma may occur. Additionally, nasal biopsies obtained in these patients may result in a significant degree of hemorrhage. Stammberger H. Functional endoscopic sinus surgery. Philadelphia: BC Decker; 1991. Kennedy DW, Zinreich SJ, Rosenbaum AE, Johns ME. Functional endoscopic sinus surgery. Theory and diagnostic evaluation. Arch Otolaryngol. 1985 Sep. 111(9):576-82. [Medline]. Levine HL. The office diagnosis of nasal and sinus disorders using rigid nasal endoscopy. Otolaryngol Head Neck Surg. 1990 Apr. 102(4):370-3. [Medline]. Lanza DC. Diagnosis of chronic rhinosinusitis. Ann Otol Rhinol Laryngol Suppl. 2004 May. 193:10-4. [Medline]. Annamalai S, Davis J, Kubba H. How subjective is nasal endoscopy? A study of interrater agreement using the Lund and Mackay scoring system. Am J Rhinol. 2004 Sep-Oct. 18(5):301-3. [Medline]. Kuhn FA. Role of endoscopy in the management of chronic rhinosinusitis. Ann Otol Rhinol Laryngol Suppl. 2004 May. 193:15-8. [Medline]. Bhattacharyya N, Lee LN. Evaluating the diagnosis of chronic rhinosinusitis based on clinical guidelines and endoscopy. Otolaryngol Head Neck Surg. 2010 Jul. 143(1):147-51. [Medline]. Shargorodsky J, Bhattacharyya N. What is the role of nasal endoscopy in the diagnosis of chronic rhinosinusitis?. Laryngoscope. 2013 Jan. 123(1):4-6. [Medline]. Ferguson BJ, Narita M, Yu VL, Wagener MM, Gwaltney JM Jr. Prospective observational study of chronic rhinosinusitis: environmental triggers and antibiotic implications. Clin Infect Dis. 2012 Jan 1. 54(1):62-8. [Medline]. Kupferberg SB, Bent JP 3rd, Kuhn FA. Prognosis for allergic fungal sinusitis. Otolaryngol Head Neck Surg. 1997 Jul. 117(1):35-41. [Medline]. Vogan JC, Bolger WE, Keyes AS. Endoscopically guided sinonasal cultures: a direct comparison with maxillary sinus aspirate cultures. Otolaryngol Head Neck Surg. 2000 Mar. 122(3):370-3. [Medline]. Benninger MS, Payne SC, Ferguson BJ, Hadley JA, Ahmad N. Endoscopically directed middle meatal cultures versus maxillary sinus taps in acute bacterial maxillary rhinosinusitis: a meta-analysis. Otolaryngol Head Neck Surg. 2006 Jan. 134(1):3-9. [Medline]. Nadel DM, Lanza DC, Kennedy DW. Endoscopically guided cultures in chronic sinusitis. Am J Rhinol. 1998 Jul-Aug. 12(4):233-41. [Medline]. Mishra P, Kaushik M, Dehadaray A, Qadri H, Raichurkar A, Seth T. Preparation of nose for nasal endoscopy: cotton pledget packing versus topical spray. A prospective randomized blinded study. Eur Arch Otorhinolaryngol. 2013 Jan. 270 (1):117-21. [Medline]. Bolger WE, Kennedy DW. 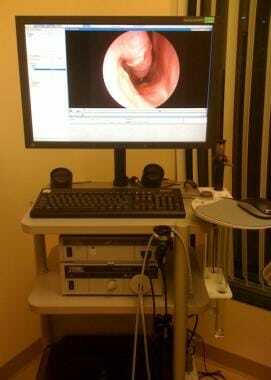 Nasal endoscopy in the outpatient clinic. Otolaryngol Clin North Am. 1992 Aug. 25(4):791-802. [Medline]. Lanza DC, Kennedy DW. Current concepts in the surgical management of nasal polyposis. J Allergy Clin Immunol. 1992 Sep. 90(3 Pt 2):543-5; discussion 546. [Medline]. Sengupta A, Maity K, Ghosh D, Basak B, Das SK, Basu D. A study on role of nasal endoscopy for diagnosis and management of epistaxis. J Indian Med Assoc. 2010 Sep. 108(9):597-8, 600-1. [Medline]. Medscape Reference thanks Vijay R Ramakrishnan, MD, Assistant Professor, Department of Otolaryngology, University of Colorado School of Medicine, for the videos in this article.